Registration for the 57th Annual Clark College Jazz Festival is now open! 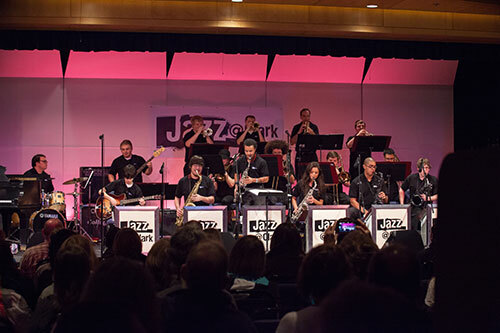 The Clark College Jazz Festival is now offering two middle school divisions! Please note that middle schools now have separate rules and regulations. You will find criteria for middle school divisions outlined in the middle school rules and regulations. If you have any questions, please contact Festival Director, Dr. Doug Harris at 360-992-2188 or daharris@clark.edu. Once you have mailed the registration form, please note you will not be officially registered until we have received your registration fee check, PO number, or credit card payment. If paying by credit card, you may fax or email your registration form; however, if paying by check or PO, please mail them to us. Make sure to address your envelope as indicated on the registration form to ensure your registration does not inadvertently get sent to another department on campus. Once we have received your registration fee or PO number you will receive an email confirmation. If you do not receive an email confirmation within two weeks of submitting a payment request to your school, we ask you check with your school first and then contact us to ensure your registration. The registration deadline for the 2019 festival is December 1, 2018. The registration fee is $225 per each ensemble. Any registrations received after the deadline will be charged a late registration fee of $250. Make sure to address your envelope as indicated on the registration form to ensure your registration does not inadvertently get sent to another department on campus. Please make checks payable to the Clark College Foundation. As always, once we have received your registration, you will receive a package with festival information in the mail. If you have any questions regarding Jazz Festival registration or would like to report technical problems with the form, please contact Shelly Williams, 360-992-2662, email: sjwilliams@clark.edu.